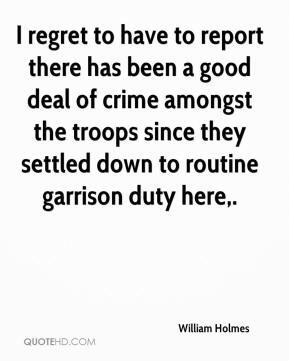 I regret to have to report there has been a good deal of crime amongst the troops since they settled down to routine garrison duty here. 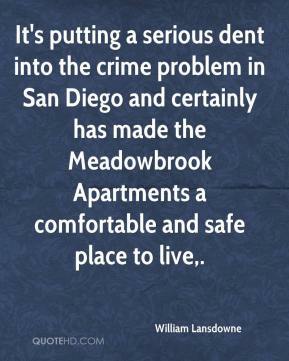 It's putting a serious dent into the crime problem in San Diego and certainly has made the Meadowbrook Apartments a comfortable and safe place to live. 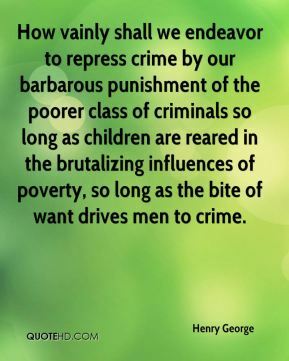 The atrocious crime of being a young man . . . 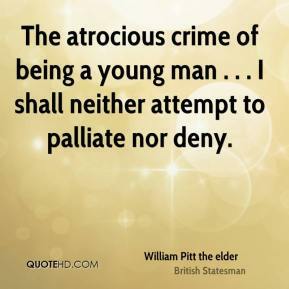 I shall neither attempt to palliate nor deny. Too late I stayed, - forgive the crime! 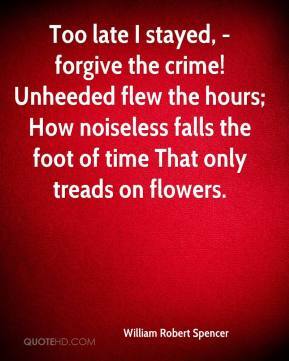 Unheeded flew the hours; How noiseless falls the foot of time That only treads on flowers. This was a horrific crime. 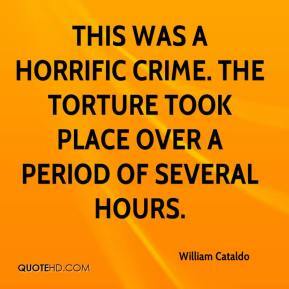 The torture took place over a period of several hours. 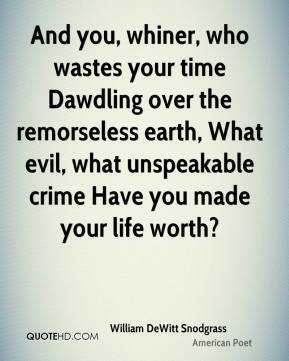 And you, whiner, who wastes your time Dawdling over the remorseless earth, What evil, what unspeakable crime Have you made your life worth? We're tremendously disappointed with the verdict. It is not a just verdict. She solved this crime. 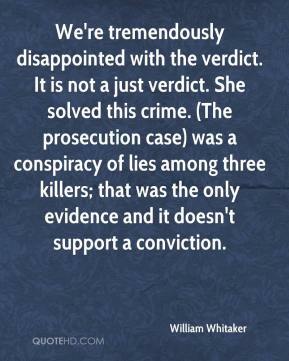 (The prosecution case) was a conspiracy of lies among three killers; that was the only evidence and it doesn't support a conviction. Home invasion is a very serious crime where the victims often feel violated because their personal, private space has been entered. 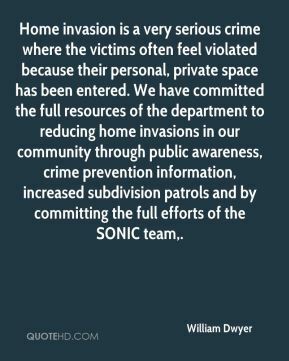 We have committed the full resources of the department to reducing home invasions in our community through public awareness, crime prevention information, increased subdivision patrols and by committing the full efforts of the SONIC team. 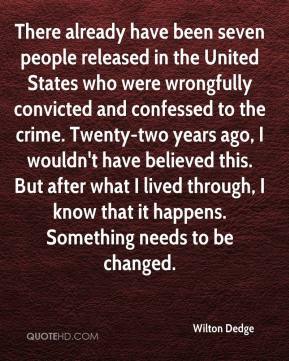 There already have been seven people released in the United States who were wrongfully convicted and confessed to the crime. Twenty-two years ago, I wouldn't have believed this. But after what I lived through, I know that it happens. Something needs to be changed. 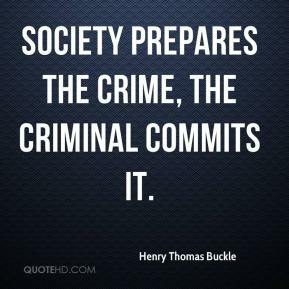 We believe that crime, at its root, is a moral issue. 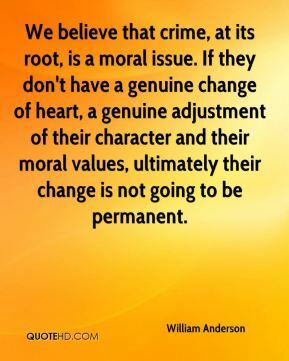 If they don't have a genuine change of heart, a genuine adjustment of their character and their moral values, ultimately their change is not going to be permanent. 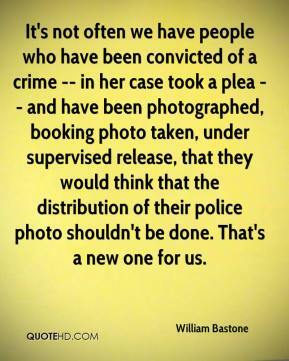 It's not often we have people who have been convicted of a crime -- in her case took a plea -- and have been photographed, booking photo taken, under supervised release, that they would think that the distribution of their police photo shouldn't be done. That's a new one for us. 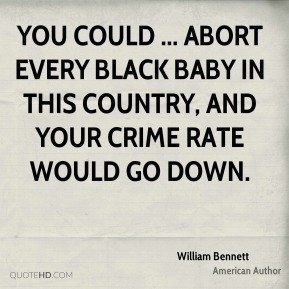 You could ... abort every black baby in this country, and your crime rate would go down. 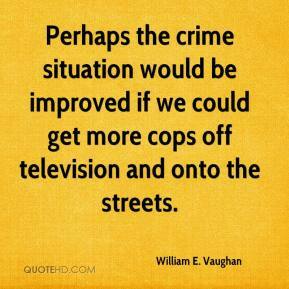 an impossible, ridiculous and morally reprehensible thing to do, but your crime rate would go down. 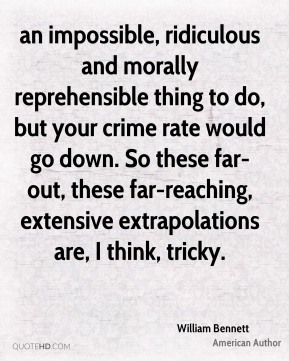 So these far-out, these far-reaching, extensive extrapolations are, I think, tricky. 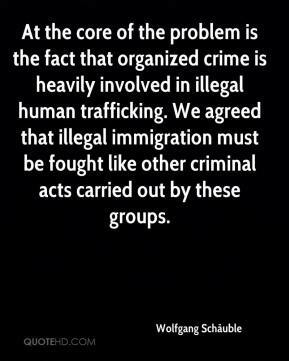 At the core of the problem is the fact that organized crime is heavily involved in illegal human trafficking. We agreed that illegal immigration must be fought like other criminal acts carried out by these groups. 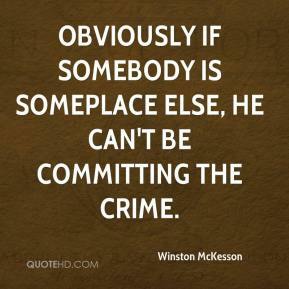 Obviously if somebody is someplace else, he can't be committing the crime. Every delay comes at our expense. 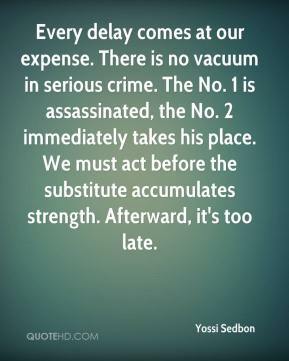 There is no vacuum in serious crime. The No. 1 is assassinated, the No. 2 immediately takes his place. We must act before the substitute accumulates strength. Afterward, it's too late. 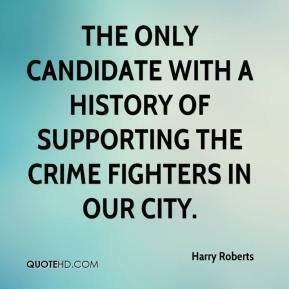 the only candidate with a history of supporting the crime fighters in our city. He was not there doing crime. 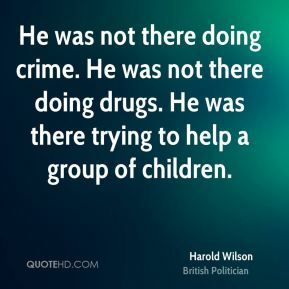 He was not there doing drugs. He was there trying to help a group of children. 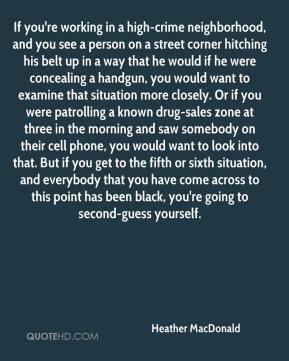 If you're working in a high-crime neighborhood, and you see a person on a street corner hitching his belt up in a way that he would if he were concealing a handgun, you would want to examine that situation more closely. Or if you were patrolling a known drug-sales zone at three in the morning and saw somebody on their cell phone, you would want to look into that. But if you get to the fifth or sixth situation, and everybody that you have come across to this point has been black, you're going to second-guess yourself. 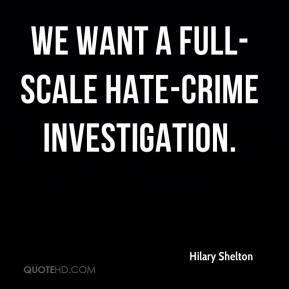 We want a full-scale hate-crime investigation. 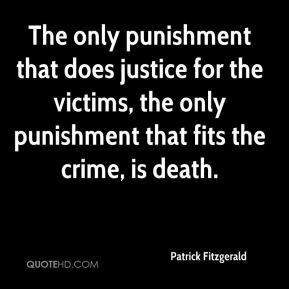 The only punishment that does justice for the victims, the only punishment that fits the crime, is death. 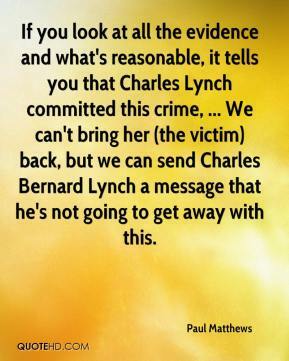 If you look at all the evidence and what's reasonable, it tells you that Charles Lynch committed this crime, ... We can't bring her (the victim) back, but we can send Charles Bernard Lynch a message that he's not going to get away with this.